Regulation (EC) No 1005/2008 provides for the adoption of detailed rules and measures to implement the provisions it sets out. In accordance with Articles 6(3) and 16(1) of Regulation (EC) No 1005/2008 the period of three working days set out for the prior notification of landings or transhipments in port and for the submission of catch certificates before the estimated time of arrival of fishery products at the place of entry into the territory of the Community may be modified in the light of certain factors. These factors include: the type of fishery product; the distance between the fishing ground, landing places and ports where the vessels in question are registered or listed; the distance to the place of entry into the territory of the Community; the transport means used. Fresh fishery products and consignments arriving by air, road or rail require a shorter period than three working days. Consistency should be ensured in documents transmitted in relation to prior notification of landings and transhipments, landing and transhipment declarations and sighting reports. For that reason formats for these must be set out in accordance with Articles 6(1), 8(3) and 49(1) of Regulation (EC) No 1005/2008. Article 9(1) and Article 17(3) of Regulation (EC) No 1005/2008 provide that Member States shall carry out port inspections of at least 5 % of landing and transhipment operations by third country fishing vessels as well as verifications deemed necessary to ensure that the provisions of the Regulation are correctly applied, in accordance with benchmarks determined on the basis of risk management and on the basis of national or Community risk management criteria. It is appropriate to lay down common risk management criteria for checking, inspection and verification activities in order to allow timely risk analyses and global assessments of relevant control information. The common criteria aim at ensuring a harmonised approach to inspection and verification in all Member States and to establish a level playing field for all operators. Article 52 of Regulation (EC) No 1005/2008 provides that measures necessary for implementing the provisions of that Regulation are to be adopted in accordance with the Committee procedure. Given the fact that the Community should take account of possible capacity constraints for the proper implementation of the certification scheme, it is deemed necessary to adapt the scheme for some fishery products obtained by small fishing vessels, introducing the possibility of a simplified catch certificate. In the absence of a general definition of small scale fisheries certain specific criteria should be laid down under which the validation of a simplified catch certificate may be requested by the exporter. These criteria should take account in the first instance of the limited capacity of the fishing vessels concerned, in relation to which the obligation to apply the standard catch certification scheme would constitute a disproportionate burden. Article 13(1) of Regulation (EC) No 1005/2008 provides for the recognition of catch documentation schemes agreed and in force in the framework of regional fisheries management organisations (hereinafter referred to as RFMO) in so far as they comply with the requirements of the Regulation. Some of these schemes can be recognised as complying with the requirements of Regulation (EC) No 1005/2008, while others are subject to additional conditions. Economic operators who fulfil the conditions for obtaining the status of approved economic operator should be able to benefit from a simplified procedure when importing fishery products into the territory of the Community. It is necessary to establish common conditions in all Member States for the granting, amendment or withdrawal of approved economic operators’ certificates, or for suspension or revocation of the status of approved economic operator, and rules on the application for and issuing of approved economic operators’ certificates. Article 12(4) of Regulation (EC) No 1005/2008 provides for an administrative cooperation between the Commission and third countries in areas pertaining to the implementation of the catch certification provisions. Within the framework of Article 20(4) of Regulation (EC) No 1005/2008, the catch certificate may be established, validated or submitted by electronic means or may be replaced by electronic traceability systems ensuring the same level of control by authorities, in agreement with flag States. These administrative arrangements with flag States shall be regularly updated and Member States and the public shall be informed in due time. According to Article 51(2) of Regulation (EC) No 1005/2008 a system shall be established for mutual assistance between the Member States, with third countries and the Commission. Such administrative cooperation is essential to ensure that the Community catch certification scheme can be applied properly and that IUU fishing is properly investigated and sanctioned. Rules should therefore be drawn up for a systematic exchange of information either on request or spontaneously, and for the possibility to request enforcement measures and administrative notification by another Member State. Practical procedures should be laid down for exchanging information and requesting assistance. However, these provisions are not such as to affect the application in the Member States of rules on judicial cooperation in criminal cases. The protection of individuals with regard to the processing of personal data by the Member States is governed by Directive 95/46/EC of the European Parliament and of the Council of 24 October 1995 on the protection of individuals with regard to the processing of personal data and on the free movement of such data (2). The protection of individuals with regard to the processing of personal data by the Commission is governed by Regulation (EC) No 45/2001 of the European Parliament and of the Council of 18 December 2000 on the protection of individuals with regard to the processing of personal data by the Community institutions and bodies and on the free movement of such data (3), in particular as regards to the requirements of confidentiality and security of processing, the transfer of personal data from the national systems of Member States to the Commission, the lawfulness of processing, and the rights of data subjects to information, access to and rectification of their personal data. Annex I of Regulation (EC) No 1005/2008, which lists the products excluded from the definition of ‘fishery products’, may be reviewed annually in accordance with Article 12(5), on the basis of information gathered under Chapters II, III, IV, V, VIII, X and XII. Hence, on the basis of the information gathered under the cooperation provided for in Article 20(4), Annex I shall be amended accordingly. By way of derogation from Article 6(1) of Regulation (EC) No 1005/2008, vessels landing the types of fishery products set out in Annex I to this Regulation shall be subject to a prior notification period of 4 hours. 1. The form for prior notification referred to in Article 6(1) of Regulation (EC) No 1005/2008 is set out in Annex IIA to this Regulation. 2. Where all catches are accompanied by a validated catch certificate, the simplified prior notification form set out in Annex IIB may be used. 1. The form of the pre-landing declaration referred to in Article 8(1) of Regulation (EC) No 1005/2008 shall be as set out in Annex IIIA to this Regulation. 2. The form of the pre-transhipment declaration referred to in Article 8(1) of Regulation (EC) No 1005/2008 shall be as set out in Annex IIIB to this Regulation. 3. A third country fishing vessel may submit the pre-landing or pre-transhipment declaration in electronic format if the Member State whose designated ports of landing and transhipment facilities it intends to use and the flag State of the vessel have agreed to electronic exchange of data. English if accepted by the Member State of landing or transhipment. 5. The pre-landing or pre-transhipment declaration shall be submitted at least 4 hours before the intended landing or transhipment. operators concerned who have already been involved in illegal activities constituting a potential risk in respect of IUU fishing. 1. Member States shall report on the application of benchmarks referred to in Article 4 in their report to be transmitted to the Commission every two years according to Article 55(1) of Regulation (EC) No 1005/2008. 2. On the basis of those reports and its own observations, the Commission shall undertake an evaluation and possible adjustment of the benchmarks. of less than measured 20 GT. 2. Catches from third country fishing vessels referred to in paragraph 1 which are only landed in the flag State of those vessels and which together constitute one consignment may be accompanied by a simplified catch certificate instead of the catch certificate referred to in Article 12 of Regulation (EC) No 1005/2008. The simplified catch certificate shall contain all the information specified in the specimen shown in Annex IV to this Regulation and shall be validated by a public authority of the flag State with the necessary powers to attest the accuracy of the information. 3. 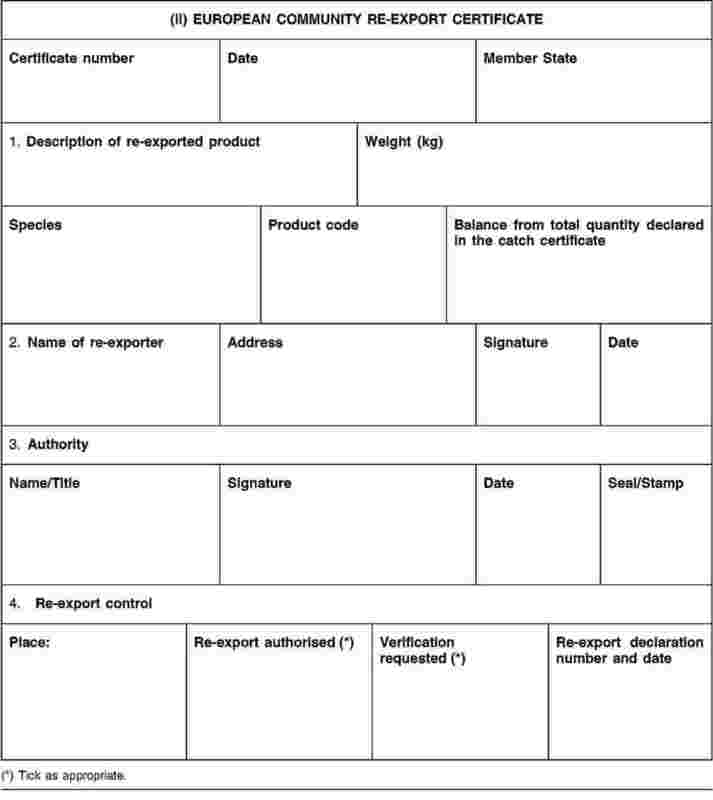 The validation of the simplified catch certificate shall be requested by the exporter of the consignment upon submission to the public authority of all the information specified in the specimen shown in Annex IV. 1. The catch documentation schemes adopted by regional fisheries management organisations listed in Annex V, Part I, to this Regulation, shall be recognised for the purposes of Article 13(1) of Regulation (EC) No 1005/2008 as complying with the requirements of that Regulation without additional conditions. 2. The catch documentation schemes adopted by regional fisheries management organisations listed in Annex V, Part II, of this Regulation, shall be recognised, for the purposes of Article 13(1) of Regulation (EC) No 1005/2008, as complying with the requirements of that Regulation subject to additional conditions. 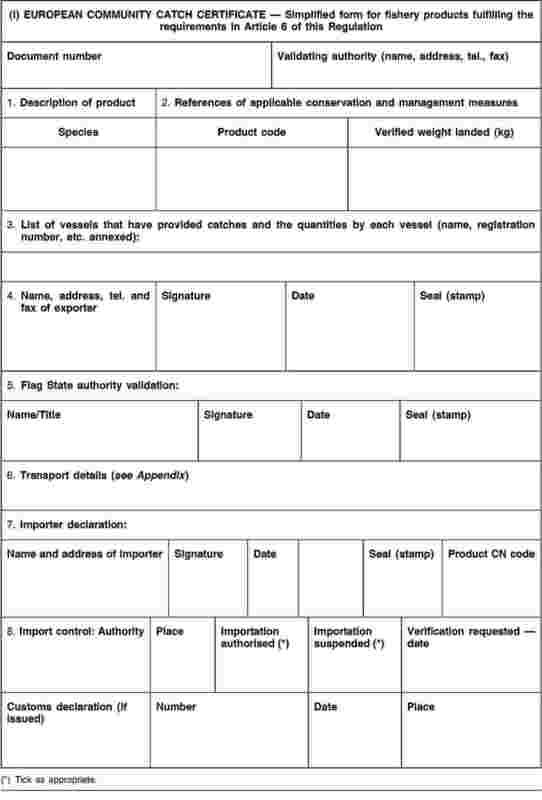 By way of derogation from Article 16(1) of Regulation (EC) No 1005/2008, the submission of catch certificates for imports of fishery products in consignments by means of transportation referred to in Annex VI to this Regulation shall be subject to the shorter deadlines set out in that Annex. fulfil the criteria laid down in Article 16(3)(a) to (g) of Regulation (EC) No 1005/2008 and detailed in Articles 10 to 13 of this Regulation. 1. The sufficient number and volume of import operations referred to in Article 16(3)(b) of Regulation (EC) No 1005/2008 must be achieved in the Member State of establishment. 2. Each Member State shall determine the minimum threshold for number and volume of import operations and inform the Commission thereof. has not directly or indirectly participated in or supported activities of vessels included in IUU vessel lists adopted by a RFMO. of negligible quantitative importance in relation to the number or size of the import-related operations carried out by the applicant. the protection against the loss of information. ensure the handling of import and/or export licenses connected to prohibitions and restrictions and to distinguish fishery products subject to catch certificates from fishery products not subject to catch certificates. 1. 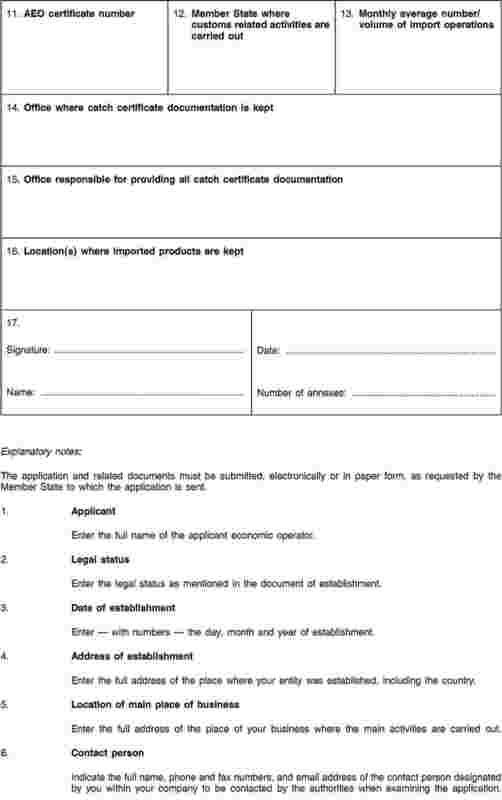 The application for an APEO certificate shall be submitted to the competent Member State authority on whose territory the importer is established in accordance with the specimen set out in Annex VII. 2. The application shall include records and documentation enabling the competent Member State authority to verify and monitor the compliance with the criteria laid down in Articles 9 to 13 of this Regulation, including a copy of the AEO certificate issued in accordance with the Implementing Rules of the Community Customs Code. Applicants shall submit necessary data to the competent Member State authority. 3. If a part of the relevant records and documentation is kept in another Member State, the consultation procedure referred to in Article 17 shall apply. 4. Where the competent Member State authority establishes that the application does not contain all the information required, it shall, within 30 calendar days of receipt of the application, require the applicant to supply the relevant information. 5. When the authority has received all the information necessary it shall inform the applicant that the application has been deemed complete, specifying the date from which the time limits laid down in Article 18(2) of this Regulation will run. 6. 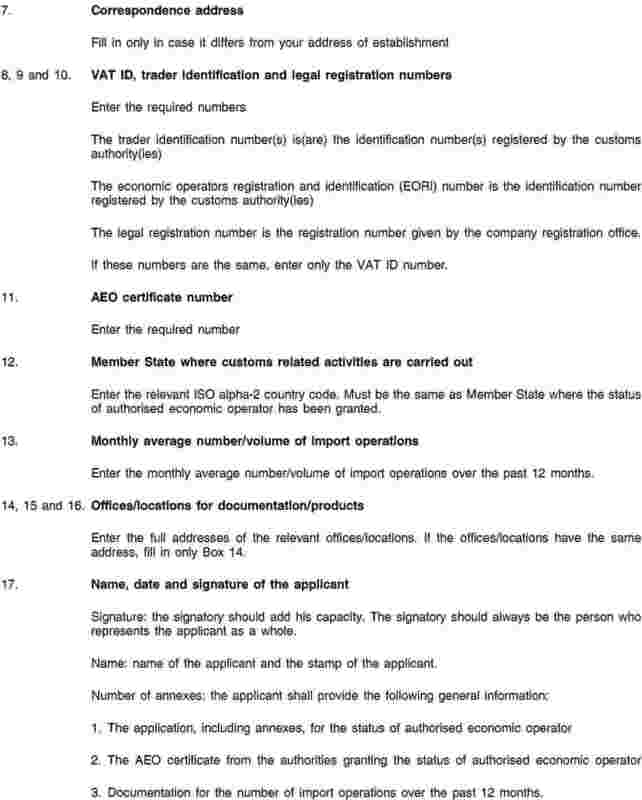 An operator who has been granted the status of approved economic operator in one Member State shall when applying for the same status in a subsequent Member State, attach a copy of the APEO certificate granted by the first Member State. where the application is submitted within three years after the withdrawal of the APEO certificate referred to in points (a), (b) and (d) of Article 27(1). 1. The issuing Member State authority shall examine whether the criteria laid down in Articles 9 to 13 are met. The examination and its results shall be documented by the competent Member State authority. 2. Where the applicant holds an ‘AEO certificate — Security and safety’ or an ‘AEO certificate — Customs simplification/security and safety’, as referred to in Article 14a of the Implementing Rules of the Community Customs Code, the criteria set out in Article 13 need not be examined. optionally, the criteria set out in Articles 10 and 11. 4. The issuing authority may accept conclusions provided by an expert in the relevant fields referred to in Articles 12 and 13 in respect of the criteria referred to in those Articles. The expert shall not in any way be related to the applicant. 1. The issuing authority shall consult the competent authorities of other Member States if the examination of the compliance with one or more of the criteria laid down in Articles 9 to 13 cannot be performed by it due either to a lack of information or to the impossibility of checking it. The consulted competent authorities of the Member States shall respond within 60 calendar days, starting from the date of the communication of the request by the issuing Member State authority. 2. If the consulted competent authority fails to respond within the deadline of 60 calendar days referred to in paragraph 1, the issuing authority may assume that the applicant meets the criteria for which the consultation took place. 1. The issuing authority shall issue the APEO certificate in accordance with the specimen set out in Annex VIII. 2. The APEO certificate shall be issued within 90 calendar days starting from the date of receipt of all the information necessary in accordance with Article 14. 3. The period of 90 calendar days provided for in paragraph 2 may be extended by one further period of 30 calendar days where the competent authority is unable to meet the deadline. In such cases, the competent Member State authority shall, before the expiry of the period referred to in paragraph 2, inform the applicant of the reasons for the extension. 4. The period provided for in paragraph 2 may also be extended if, in the course of the examination of the compliance with the criteria laid down in Articles 9 to 13, the applicant carries out adjustments in order to satisfy those criteria and communicates them to the competent authority. 1. Where the result of the examination carried out in accordance with Articles 16 and 17 is likely to lead to the rejection of the application, the issuing authority shall communicate the findings to the applicant and provide him with the opportunity to respond within 30 calendar days, before rejecting the application. The period laid down in paragraph 2 shall be suspended accordingly. 2. If the application is rejected, the competent authority shall inform the applicant of the reasons on which the decision is based. The decision to reject an application shall be notified to the applicant within the time limits laid down in paragraphs 2, 3 and 4 of Article 18 and paragraph 1 of this Article. 3. The issuing authority shall inform the Commission, as soon as possible, that an application has been rejected. The Commission shall make that information available to the competent authorities of the other Member States by electronic means. 1. When the holder of an APEO certificate has advised the competent Member State authority of the arrival of fishery products, that authority may, before the arrival of the consignment into that Member State, notify the approved economic operator when, as a result of a risk analysis in accordance with Article 17 of Regulation (EC) No 1005/2008, the consignment has been selected for further verification. That notice shall only be provided where it does not jeopardise the verification to be carried out. 2. The holder of an APEO certificate shall be subject to fewer physical and document-based verifications than other importers, unless the competent Member State authority decides otherwise in order to take into account a specific risk, or control obligations set out in other Community legislation. 3. Where, following a risk analysis, the competent Member State authority selects for further examination a consignment accompanied by a catch certificate lodged by an approved economic operator, it shall carry out the necessary verifications as a matter of priority. If the approved economic operator so requests, and subject to agreement with the competent Member State authority concerned, those verifications may be carried out at a place which is different from the place of the office of the competent Member State authority. 1. The APEO certificate shall take effect on the tenth working day after the date of its issue. Its period of validity shall not be limited. 2. 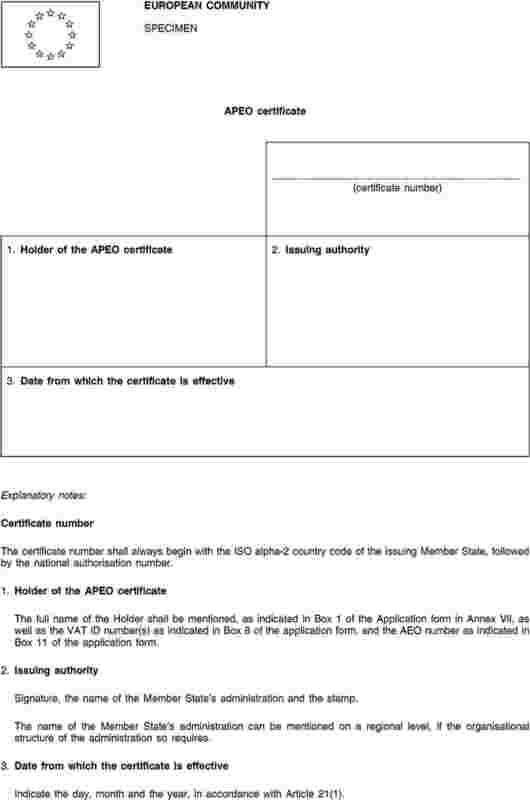 The APEO certificate shall only be valid in the Member State of the issuing authority. 3. The competent authorities shall monitor compliance with the criteria laid down in Articles 9 to 13. 4. In the case of an APEO certificate issued to an applicant established for less than three years, close monitoring shall take place during the first year after issue. reasonable indication that the relevant criteria are no longer met by the approved economic operator. 6. Article 16(4) shall apply to the reassessment. 7. The issuing authority shall inform the Commission, as soon as possible, of the results of the reassessment. The Commission shall make that information available to the competent authorities of all Member States, by electronic means. where the suspension is requested by the approved economic operator which is temporarily unable to meet any of the criteria laid down in Articles 9 to 13. 2. Before taking a decision in accordance with paragraph 1(a), (b) and (c), the competent Member State authorities shall communicate their findings to the economic operator concerned. The operators shall be entitled to express its point of view within 30 calendar days starting from the date of receiving the communication. 3. However, where the nature or the level of the threat to the conservation measures for a certain stock or stocks so require, suspension shall take place immediately. The suspending authority shall immediately inform the Commission in order to permit other Member States to take appropriate action. 4. The suspension referred to in paragraph 1 shall take effect from the day following its notification to the approved economic operator. The suspension shall however not affect any import procedure already started before the date of suspension and not yet completed. 1. In the case referred to in point (a) of Article 22(1), if the approved economic operator does not regularise the situation within the period referred to in paragraph 2 of that Article, the status of approved economic operator shall be suspended for a period of 30 calendar days. The competent Member State authority shall, without delay, notify the economic operator of the suspension and the competent authorities of the other Member States. 2. Where the economic operator concerned has been unable to regularise the situation within the suspension period of 30 calendar days referred to in paragraph 1 but can provide evidence that the conditions can be met if the suspension period is extended, the issuing authority shall suspend the status of approved economic operator for a further 30 calendar days. The competent authorities of the other Member States shall be informed of the extension. 3. When the economic operator concerned has, within the time limit set out in paragraphs 1 or 2, taken the necessary measures to comply with the criteria laid down in Articles 9 to 13, the issuing authority shall withdraw the suspension and inform the economic operator concerned and the Commission. The suspension may be withdrawn before the expiry of the time limit laid down in paragraphs 1 or 2. 1. In the case referred to in point (b) of Article 22(1), the issuing authority shall suspend the status of the approved economic operator for the duration of the proceedings. It shall notify the approved economic operator thereof. Notification shall also be sent to the competent authorities of the other Member States. 2. The competent Member State authority may however decide not to suspend the status of approved economic operator if it considers the infringement to be of negligible quantitative importance in relation to the number or volume of the import-related operations carried out by that operator. In the case referred to in point (c) of Article 22(1), the issuing authority shall suspend the status of the approved economic operator until the suspension of the status of authorised economic operator has been withdrawn. It shall notify the approved economic operator thereof. It shall also notify the competent authorities of the other Member States. 1. In the case referred to in Article 22(1)(d) the approved economic operator shall notify the issuing authority of its temporary inability to meet the criteria laid down in Articles 9 to 13, specifying the date when the criteria will be met again. The approved economic shall also notify the issuing authority of any planned measures and their timescale. 2. The issuing authority shall send the notification to the Commission and the competent authorities of the other Member States. 3. If the approved economic operator fails to regularise the situation within the period set out in its notification, the issuing authority may grant a reasonable extension, provided that the approved economic operator has acted in good faith. The extension shall be notified to the Commission and the competent authorities of the other Member States. upon request of the approved economic operator. 2. In the case referred to in point (b) of paragraph 1, the competent authority may decide not to withdraw the APEO certificate if the infringements are of negligible quantitative importance in relation to the number or size of the import-related operations carried out by that operator. 3. The withdrawal shall take effect from the day following its notification to the approved economic operator. 4. The issuing authority shall immediately inform the Commission of the withdrawal of an APEO certificate. 1. The approved economic operator shall inform the issuing authority of all factors arising after the certificate is granted which may influence its continuation. 2. All relevant information at the disposal of the issuing authority concerning economic operators approved by it shall upon request be made available to the Commission and the competent authorities of the other Member States where the approved economic operators carry out import-related activities. the APEO certificates, and where applicable, their amendment or withdrawal of those certificates, or the suspension of the status of approved economic operator. 2. The IUU fishing information system referred to in Article 51 of Regulation (EC) No 1005/2008 may be used for the information and communication process between the competent authorities and for information of the Commission and of the economic operators as provided for in this chapter. 3. The list of approved economic operators may be disclosed by the Commission to the public via the Internet with prior agreement of the approved economic operators concerned. The list shall be kept up to date. 1. Member States shall include information on the application of the approved economic operator scheme as laid down in this chapter in their report to be transmitted to the Commission every two years according to Article 55(1) of Regulation (EC) No 1005/2008. 2. On the basis of those reports and its own observations, the Commission shall undertake an evaluation and possible adjustment of the approved economic operator scheme. 1. Member States shall include information on the application of the Community criteria referred to in Article 31 in their report to be transmitted to the Commission every two years according to Article 55(1) of Regulation (EC) No 1005/2008. 2. On the basis of those reports and its own observations, the Commission shall undertake an evaluation and possible adjustment of the Community criteria. 1. The administrative arrangements in which the catch certificate is established, validated or submitted by electronic means or is replaced by electronic traceability systems ensuring the same level of control by authorities, established within the framework of the administrative cooperation set out in Article 20(4) of Regulation (EC) No 1005/2008, are listed in Annex IX to this Regulation. 2. The Commission shall within 15 working days after establishment of a new administrative arrangement pertaining to the implementation of the catch certification provisions of Regulation (EC) No 1005/2008, inform the competent authorities of Member States thereof, place the information on its website as soon as possible and update Annex IX to this Regulation. 1. 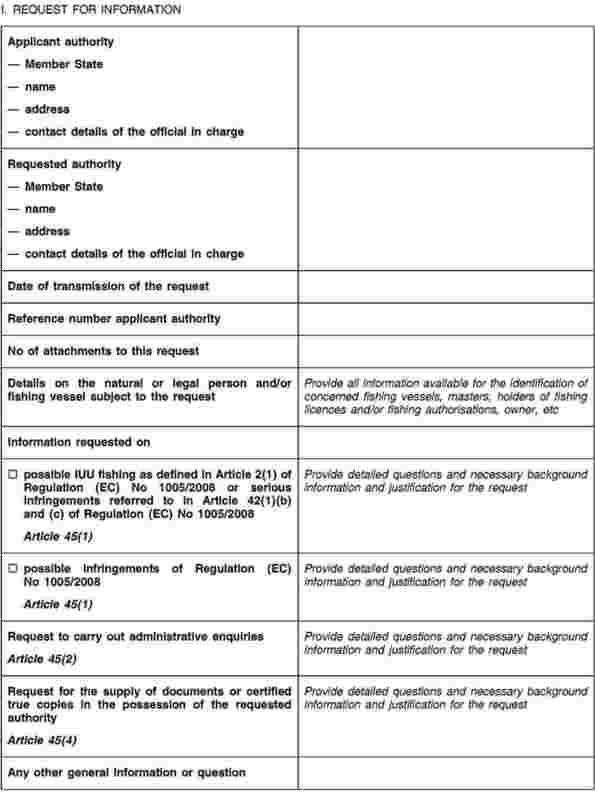 The form for submission of information regarding sighted fishing vessels referred to in Article 49(1) of Regulation (EC) No 1005/2008 is set out in Annex XA to this Regulation. 2. The instructions for filling in the form referred to in paragraph 1 are set out in Annex XB to this Regulation. 1. This Title lays down the conditions under which the Member States shall administratively cooperate with each other, third countries, the Commission and the body designated by it in order to ensure the effective application of Regulation (EC) No 1005/2008 and this Regulation. 2. This Title shall not bind Member States to grant each other assistance where that would be likely to be injurious to their national legal system, public policy, security or other fundamental interests. Before denying a request for assistance, the requested Member State shall consult the applicant Member State to determine whether assistance may be given in part, subject to specific terms and conditions. Where a request for assistance cannot be complied with the applicant Member State and the Commission shall promptly be notified of that fact and reasons shall be stated. 3. This Title shall not affect the application in the Member States of rules on criminal procedure and mutual assistance in criminal matters, including those on secrecy of judicial inquiries. 1. This Regulation leaves intact and in no way affects the level of protection of individuals with regard to the processing of personal data under the provisions of Community and national law, and in particular does not alter either the obligations of Member States relating to their processing of personal data under Directive 95/46/EC or the obligations of the Community institutions and bodies relating to their processing of personal data under Regulation (EC) No 45/2001 when fulfilling their responsibilities. The Member States and the Commission shall ensure that all applicable provisions laid down in Regulation (EC) No 45/2001 and Directive 95/46/EC are respected. 2. 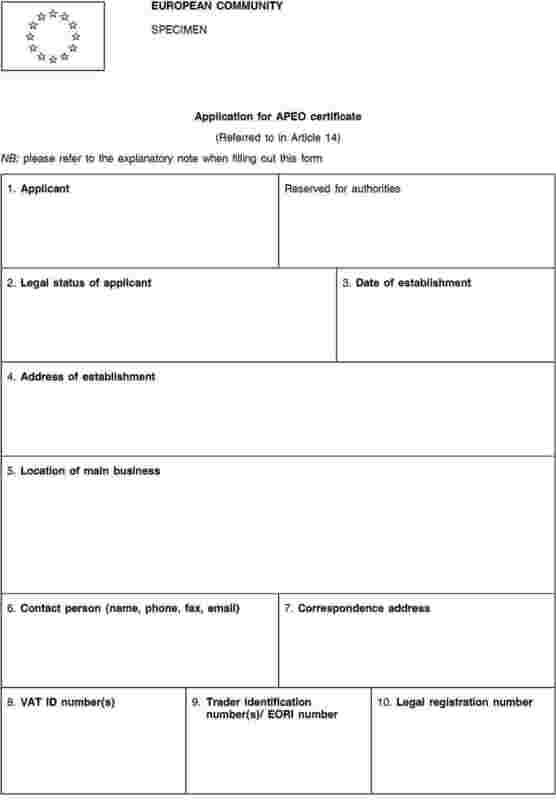 The rights of persons with regard to their registration data processed in national systems shall be exercised in accordance with the law of the Member State which stored their personal data, and in particular the provisions implementing Directive 95/46/EC, and, with regard to their registration data processed in Community systems, shall be exercised in accordance with Regulation (EC) No 45/2001. 1. The applicant Member State shall use information communicated according to this Title solely for the purposes of implementing Regulation (EC) No 1005/2008 and at all times in accordance with Directive 95/46/EC. The use of such information for other purposes shall be subject to prior written consultation of the requested Member State which provided the information. Such use shall then be subject to any conditions established by the requested Member State for non-disclosure of information in accordance with Directive 95/46/EC. The use of personal information data for other purposes shall be in compliance with the conditions laid down in Directive 95/46/EC. 2. The applicant Member State shall consider specific demands related to disclosure of the information such as the safety and privacy of persons identified or identifiable by the information. 3. The information shall benefit from the same protection accorded to similar data by the national legislation of the Member State receiving them and, for a Community institution receiving them, by the corresponding provisions applicable to this institution. It may be invoked as evidence in administrative or criminal proceedings by the Member State receiving the information, in accordance with the law of that Member State. the purpose of inspections or investigations. 5. Paragraph 4 shall not apply where the disclosure is necessary to bring about the cessation of IUU fishing or serious infringements referred to in Article 42(1)(b) and (c) of Regulation (EC) No 1005/2008 and the authority communicating the information consents to its disclosure. Member States shall bear their own costs of executing a request for assistance and shall waive all claims for the reimbursement of expenses incurred in applying this Title. 1. Each Member State shall designate a single liaison office responsible for the application of this Title. 2. Each Member State shall communicate to the Commission and the other Member States the identity of the single liaison office and keep that information up to date. 3. The Commission shall publish and update the list of single liaison offices in the Official Journal of the European Union. 1. Where national authorities decide, in response to a request for assistance based on this Title or following a spontaneous exchange of information, to take measures which may be implemented only with the authorisation or at the demand of a judicial authority, they shall communicate to the Member State concerned and the Commission any information on those measures which is related to IUU fishing or serious infringements referred to in Article 42(1)(b) and (c) of Regulation (EC) No 1005/2008, or to infringements of this Regulation. 2. Any such communication must have the prior authorisation of the judicial authority if such authorisation is required by national law. 1. When a Member State becomes aware of any potential IUU fishing activity or serious infringements referred to in Article 42(1)(b) and (c) of Regulation (EC) No 1005/2008 or reasonably suspects that such an activity or infringement may occur, it shall notify the other Member States concerned and the Commission, without delay. That notification shall supply all necessary information and shall be made via the single authority as referred to in Article 39. 2. When a Member State takes enforcement measures in relation to an IUU fishing activity or infringement referred to in paragraph 1, it shall notify the other Member States concerned and the Commission via the single authority as referred to in Article 39. 3. All notifications according to this Article shall be made in writing. 1. The applicant Member State shall ensure that all requests for assistance contain sufficient information to enable a requested Member State to fulfil the request, including any necessary evidence obtainable in the territory of the applicant Member State. 2. Requests for assistance shall be limited to substantiated cases where there is reasonable cause to believe that IUU fishing or serious infringements referred to in Article 42(1)(b) and (c) of Regulation (EC) No 1005/2008 have occurred and where the applicant Member State is not able to obtain the requested information or to take the requested measures by its own means. 1. Requests shall only be sent by the single authority of the applicant Member State or by the Commission to the single authority of the requested Member State. All replies to a request shall be communicated in the same way. 2. Requests for mutual assistance and the respective replies shall be made in writing. 3. The languages used for requests and for the communication of information shall be agreed by the single authorities concerned before requests are made. If no agreement can be reached, requests shall be communicated in the official language(s) of the applicant Member State and replies in the official language(s) of the requested Member State. 1. A requested Member State shall, at the request of an applicant Member State, or of the Commission, supply any relevant information required to establish whether IUU fishing or serious infringements referred to in Article 42(1)(b) and (c) of Regulation (EC) No 1005/2008 have occurred or to establish whether there is a reasonable suspicion it may occur. That information shall be supplied via the single authority as referred to in Article 39. 2. 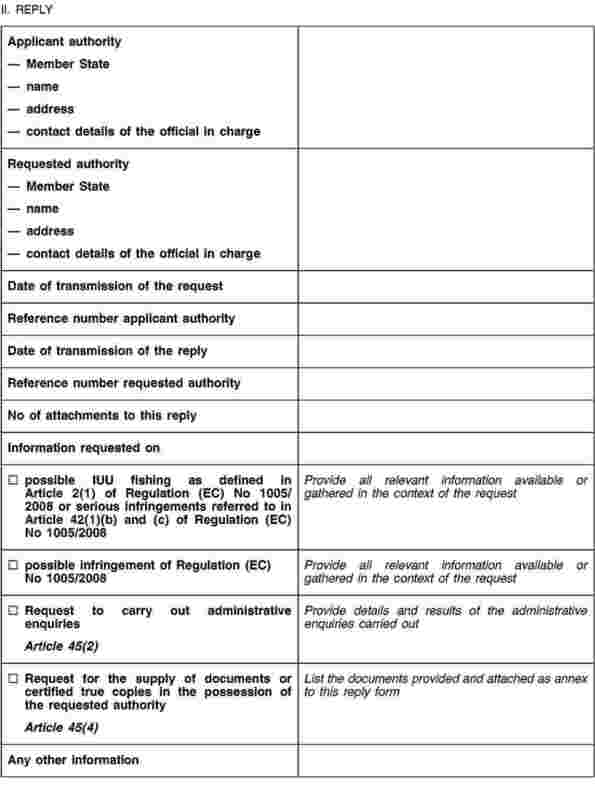 The requested Member State shall, at the request of the applicant Member State or of the Commission, carry out the appropriate administrative enquiries concerning operations which constitute, or appear to the applicant Member State to constitute, IUU fishing or serious infringements referred to in Article 42(1)(b) and (c) of Regulation (EC) No 1005/2008. The requested Member State shall communicate the results of such administrative enquiries to the applicant Member State and to the Commission. 3. 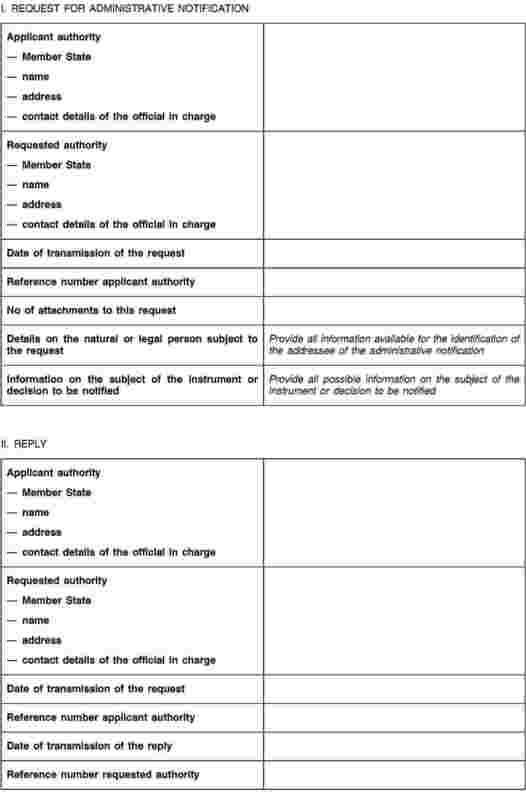 At the request of the applicant Member State, or of the Commission, the requested Member State may permit a competent official of the applicant Member State to accompany the officials of the requested Member State or of the Commission, in the course of administrative enquiries referred to in paragraph 2. In so far as national provisions on criminal proceedings restrict certain acts to officials specifically designated by national law, the officials of the applicant Member State shall not take part in such acts. In no event, shall they participate in searches of premises or the formal questioning of persons under criminal law. The officials of the applicant Member States present in the requested Member State must at all time be able to present written authority stating their identity and their official functions. 4. At the request of the applicant Member State, the requested Member State shall supply it with any document or certified true copies in its possession which relates to IUU fishing or serious infringements referred to in Article 42(1)(b) and (c) of Regulation (EC) No 1005/2008. 5. The standard form for the exchange of information on request is set out in Annex XI. 1. A requested Member State shall, based on the evidence referred to in Article 43, at the request of an applicant Member State, or of the Commission, take all necessary enforcement measures to bring about the cessation, within its territory or within maritime waters under its sovereignty or jurisdiction, of any IUU fishing or serious infringements referred to in Article 42(1)(b) and (c) of Regulation (EC) No 1005/2008 without delay. 2. The requested Member State may consult the applicant Member State and the Commission in the course of taking the enforcement measures referred to in paragraph 1. 3. The requested Member State shall report the measures taken and their effect to the applicant Member State, the other Member States concerned and the Commission, via the single authority as referred to in Article 39. 1. The requested Member State shall provide the information referred to in Article 45(1) and Article 46 (3) as quickly as possible, but not later than 4 weeks following the date of receipt of the request. Different time limits may be agreed between the requested and the applicant Member State or the Commission. 2. Where the requested Member State is unable to respond to the request by the deadline, it shall inform the applicant Member State or the Commission in writing of the reason for its failure to do so, and indicate when it considers it will be able to respond. 1. A requested Member State shall, at the request of an applicant Member State and in accordance with its national rules governing the notification of similar instruments and decisions, notify the addressee of all instruments and decisions taken in the field covered by Regulation (EC) No 1005/2008 which emanate from the administrative authorities of the applicant Member State and are to be served in the territory of the requested Member State. 2. Requests for notification shall be made using the standard form attached to this Regulation in Annex XII. 3. The requested Member State shall transmit its reply to the applicant Member State immediately after the notification via the single authority referred to in Article 39. The reply shall be made using the standard form attached to this Regulation in Annex XII. 1. Each Member State shall communicate to the Commission as soon as it is available to it any information it considers relevant concerning methods, practices or revealed tendencies used or suspected of having been used for IUU fishing or serious infringements referred to in Article 42(1)(b) and (c) of Regulation (EC) No 1005/2008. 2. The Commission shall communicate to the Member States, as soon as it becomes available to it, any information that would help them to enforce the implementation of Regulation (EC) No 1005/2008. 1. Where a Member State becomes aware of operations which constitute, or appear to constitute, IUU fishing or serious infringements referred to in Article 42(1)(b) and (c) of Regulation (EC) No 1005/2008 and which are of particular relevance at Community level, it shall communicate to the Commission as soon as possible any relevant information needed to determine the facts. The Commission shall convey that information to the other Member States concerned. it appears likely to the Member State that similar operations have also been carried out in other Member States. 3. Where the Commission considers that operations which constitute IUU fishing or serious infringements referred to in Article 42(1)(b) and (c) of Regulation (EC) No 1005/2008 have taken place in one or more Member States, it shall inform the Member States concerned thereof which shall as soon as possible carry out enquiries. The Member States concerned shall, as soon as possible, communicate to the Commission the findings of those enquiries. 1. When a Member State receives information relevant to ensure the effective application of Regulation (EC) No 1005/2008 and this Regulation from a third country, it shall communicate that information to the other Member States concerned via the single authority, in so far as it is permitted to do so by bilateral assistance agreements with that third country. 2. Information received under this Title may be communicated to a third country by a Member State via its single authority under a bilateral assistance agreement with that third country; That communication shall take place after consultation of the Member State that originally communicated the information and in accordance with Community legislation and national legislation regarding the protection of individuals with regard to the processing of personal data. 3. The Commission may, in the framework of fisheries agreements concluded between the Community and third countries or in the framework of Regional Fisheries Management Organisations or similar arrangements to which the Community is a Contracting Party or a non-contracting Cooperating Party, communicate relevant information concerning IUU fishing or serious infringements referred to in Article 42(1)(b) and (c) of Regulation (EC) No 1005/2008 to other parties to those agreements, organisations or arrangements, subject to the consent of the Member State that supplied the information. Pending the establishment of the ‘IUU Fishing Information System’, as referred to in Article 51(2) of Regulation (EC) No 1005/2008, the competent authorities of the Member States shall cooperate under this title with each other and the Commission through existing information arrangements. Annex I of Regulation (EC) No 1005/2008, containing the list of products excluded from the definition of ‘fisheries products’ in Article 2(8) of that Regulation is amended as set out in Annex XIII to this Regulation. Done at Brussels, 22 October 2009. (1) OJ L 286, 29.10.2008, p. 1. (4) OJ L 333, 20.12.2003, p. 17. (5) OJ L 226, 25.6.2004, p. 83. Landings of fresh fishery products by fishing vessels into designated Community ports. Dissostichus spp. 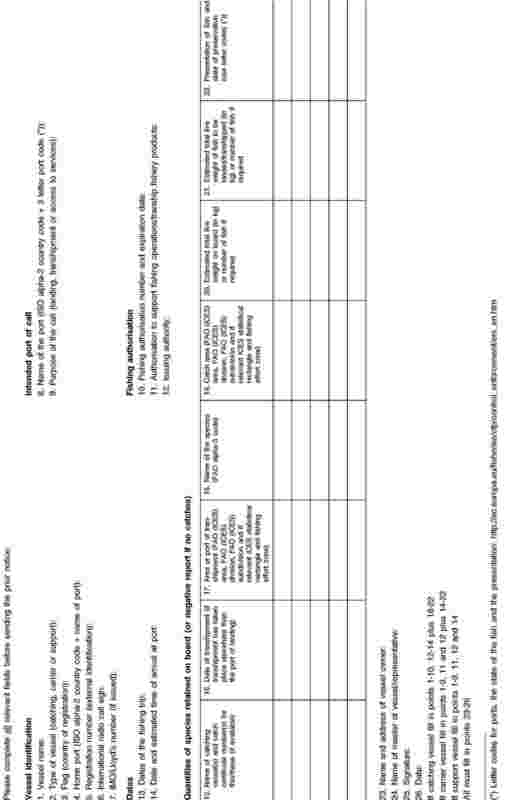 catch documentation scheme as set out in Council Regulation (EC) No 1035/2001 of 22 May 2001 establishing a catch documentation scheme for Dissostichus spp (1). ICCAT Bluefin tuna Catch Documentation Programme as set out in ICCAT Recommendation 08-12 amending 07-10 on an ICCAT Bluefin tuna Catch Documentation Programme. CCSBT (Commission for the Conservation of Southern Bluefin Tuna) — Resolution on the implementation of a CCSBT Catch Documentation scheme (adopted at the Fifteenth Annual Meeting — 14-17 October 2008). 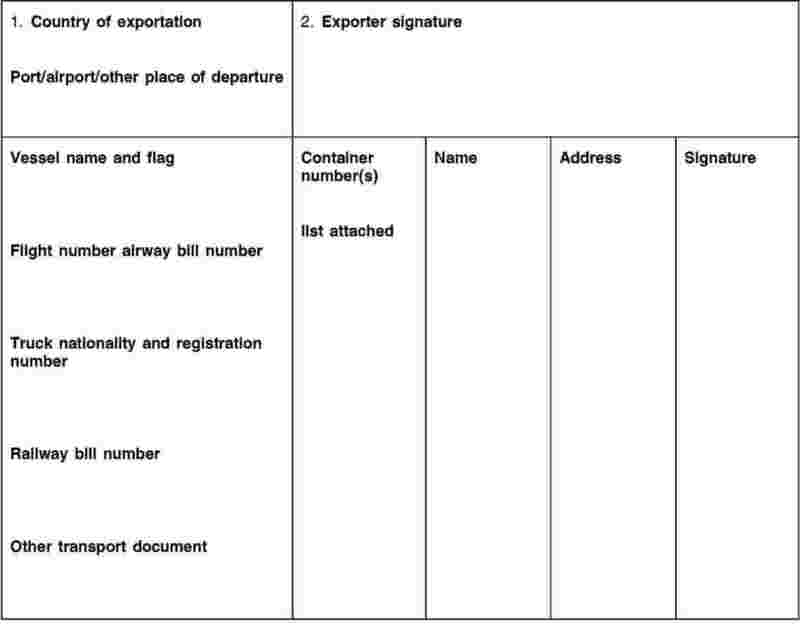 In addition to the catch documents and any related documents validated in conformity with the CCSBT Catch Documentation scheme, the importer shall submit to the authorities of the Member States of importation the information on transport details, specified in the Appendix on transport details included in Annex II of Regulation (EC) No 1005/2008. (1) OJ L 145, 31.5.2001, p. 1. Vessel name, call sign, flag and if possible registration and Lloyd IMO number are to be obtained from what is seen on the vessel or from radio contact with the vessels (the source of this information must be reported). Distinguishing markings: state whether the name and port of registration of the vessel was visible or not. Record hull and superstructure colours, number of masts, position of bridge and funnel length, etc. Type of vessel: describe the type of vessel and gear sighted (e.g. longliner, trawler, factory ship, carrier ship). Position: record the initial sighting of the vessel, including fishing area/subarea/division. Activity of the sighted vessel: record the time of the sighting, activity of the vessel at that time and heading (degrees). Record whether the vessel was fishing, setting fishing gear, trawling, hauling or other activities. 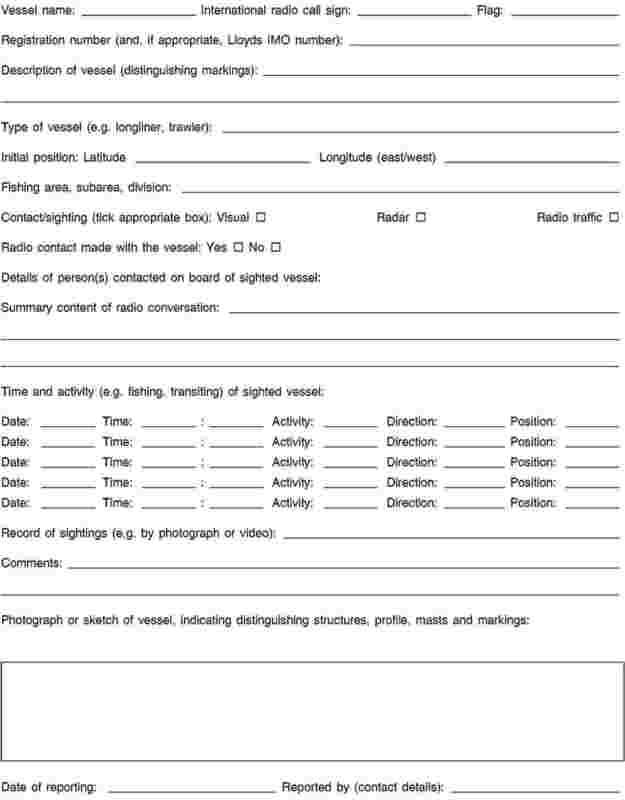 Space is available for up to five sightings of the same vessel, if more space is needed complete this section on the back of the form or on a separate sheet of paper. Record presence/absence of a streamer line. Record of sighting: indicate if the sighting of the vessel was recorded on video or with photographs (record where documents have been deposited under comments). Comments: indicate the direction in which the vessel was transiting. Summarise any radio conversation that took place with indication of the name, nationality, position given by the person(s) contacted on board of the sighted vessel. Diagram of vessel: draw the profile of the vessel, indicating any distinguishing markings that could be used for identification. 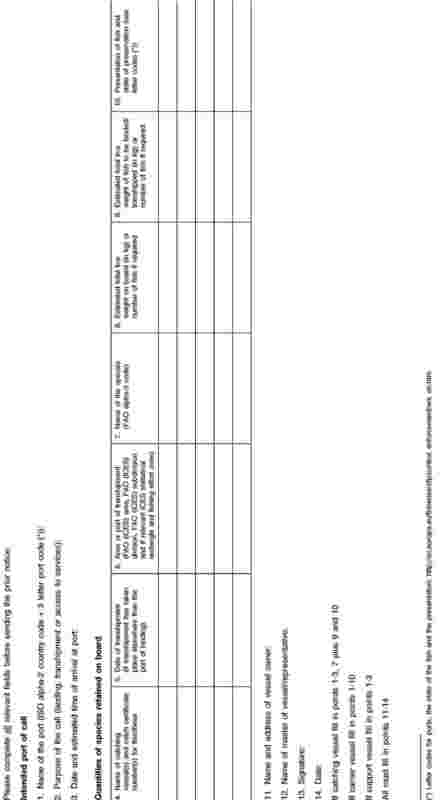 (1) CN codes corresponding to Commission Regulation (EC) No 1031/2008 (OJ L 291, 31.10.2008).